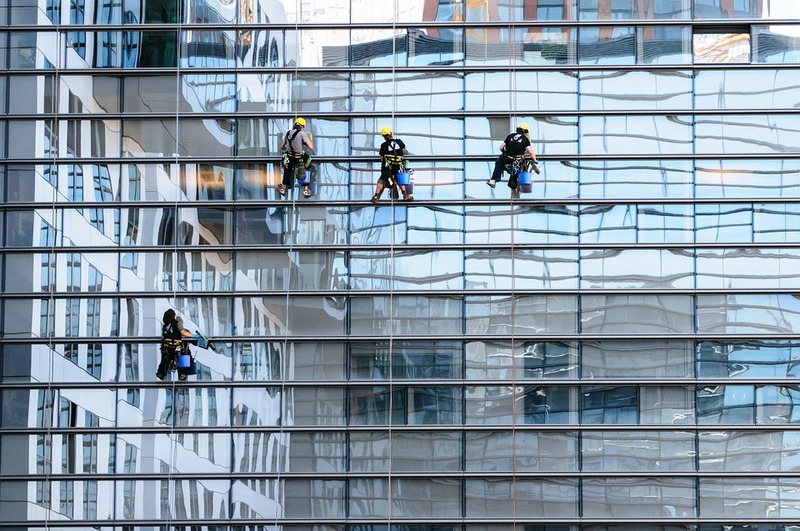 Window cleaning can often prove a difficult task when using the wrong supplies. To regain the crystal-clear finish the glass once had, it is important to assess your needs and apply the appropriate cleaning supplies to deal with it. Windows are highly unprotected areas of any building. On the outside, they bear brunt of the elements, encountering an assault of airborne contaminations, such as pollen, pollution and general dirt, as well as waterborne minerals and sediments, perhaps carried on groundwater. Inside, they see no reprieve, having sticky hands, general grime from people leaning on them, or the evaporated oil and grease from poorly ventilated kitchens coating its surface. And yet, when we attempt to clean them, another common cause for dirty windows is the inexperienced application of inadequate supplies. In fact, weak chemicals paired with inferior equipment can leave your mildly speckled windows as a streaky, grimy disaster. A premium finish on any glass requires the use of premium products. Only high-quality chemicals applied with well-designed equipment will be enough to remove the harmful foreign agents and impure minerals collecting on your windows. For example, if you have to clean high windows, a good practise is to use a water-fed extension pole and larger squeegees, to prevent the need for dangerously reaching from a ladder and not applying appropriate attention to the glass. The reverse is true for smaller, lower windows, as a reduced squeegee and microfiber rag will promote finer detailing. When choosing chemicals, assess your stains and proceed accordingly. If you find tough stains, you will likely need stain-removal chemicals, applied with window track cleaning brushes, white scourers, perhaps alongside additional speciality chemicals. If you treat glass well, it will do the same in return. Applying appropriate cleaners and reliable chemicals to windows will exponentially aid their durability and stability throughout their lifespan, greatly reducing future maintenance costs and health risks. High quality window cleaning supplies are designed to remove and keep away harmful contaminants on the glass, seals and frames. If not, windows are liable to be ruined by oxidation, weathering impacts, air leaks, fogging, and condensation, leading to ideal moisture-ridden environments for mould and mildew to develop. Here at Ionic Systems, we have the privilege of being the world’s leading manufacturers of the Reach and Wash System, as well as a long list of additional supplies, including window cleaning kits, poles, scrapers, blades, squeeges and accessories. If you would prefer a highly experienced professional cleaner, equipped with the best cleaning supplies, to restore your windows to their former glory, get in touch with our team today to get your equipment quote.